These are the short pillars that are dotted abut the top of the ridge on the north side. There are numerous projects in progress. Climbs are from left to right, with double ring or V chain anchors (unless stated otherwise in the route description). Access is generally from the top track and by taking a side track across to the ridge. Unfortunately viewing the routes from the top will make to hard to ascertain exactly where you are. Alternatively one of the multi-pitch routes can be climbed and another route in this area added as a bonus. 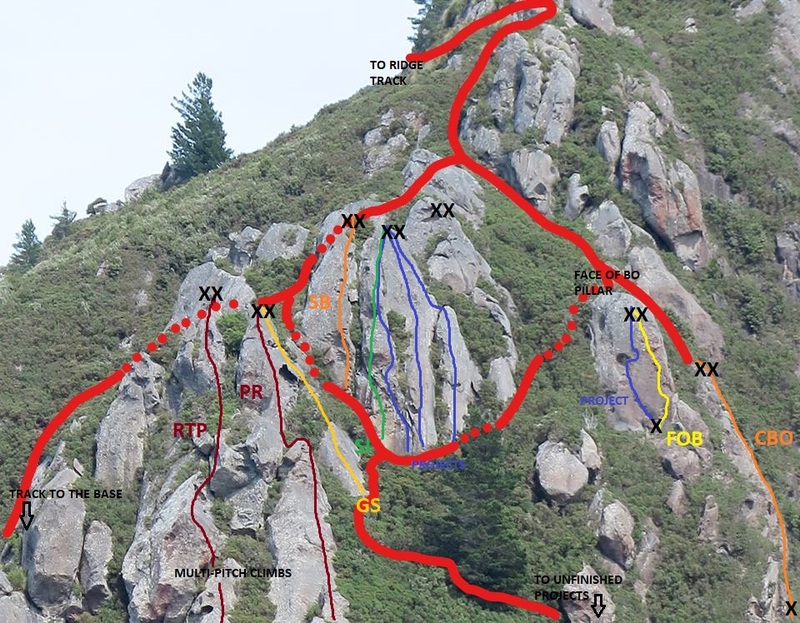 A steepish start on heavily featured, funky rock, passing 4 bolts. This leads into the crux moves turning onto the slab. Continue up the easy slab, with spaced bolts to the top of the pillar, staying to the right of the arete to avoid hollow formations. Bolt numbers on these routes are a guess, but should be close enough.